Every planetary system forms from a thin disk of gas and dust in orbit around a young star. 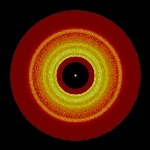 Planets grow from collisions and mergers of smaller objects, known as planetesimals, embedded in the disk. Protoplanets with radii of 100 km or more stir up the remaining planetesimals along their orbits. A cascade of collisions among rapidly moving planetesimals produces a ring of dust grains, which slowly disappears as protoplanets grow into planets. This process can lead to planetary systems similar to our own.